The snub-nosed revolvers have a loyal following because of their simplicity of operation and are easy to conceal, be it on nightstand duty, tucking in your vehicle’s console or using vehicle holsters. If you are looking for a snubbie, then the Taurus 605 revolver is your biggest accomplice. The 605 has been among the best Taurus products for years and is a great option if you are broke but need a snubbie. Being a concealable weapon, acquiring the best of the 605 holster enhances the portability your gun and you can be sure to be all psyched up. 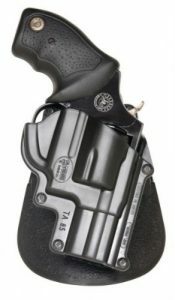 To be on the right track, you will require a holster that matches your gun’s description. You will consider things like the holding weight of the holster, usability, and comfortability. 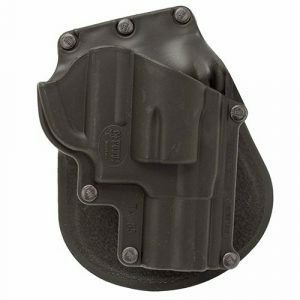 While doing rounds regarding Taurus 605 holster, we came across the Cal38T6 Taurus 605 which we found to be our favorite. 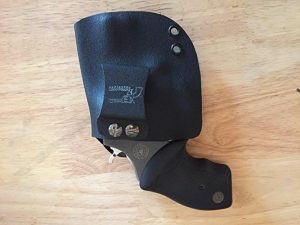 It is that type of holster with an inside surface that is covered by fabric line and has a distinct retention system making it easy to withdraw in emergency situations. The holster fits perfectly with the Taurus 605 gun. The use of handguns has been in existence for many decades. Holsters manufacturers have continually brought new and improved holsters in the market to ensure the gun holders carry their weapons safely and comfortably. The use of holsters has changed the way firearms are carried around, moving from the usual way of stuffing into your pants or concealing them in your coats. They have provided a safe of moving around with your gun. How the holster looks, feels, holds and protects doesn’t matter if it keeps on rubbing against you every time you wear it. Carrying a concealed snubbie that keeps on rubbing against you causes discomfort. You might find yourself carrying less of it just to avoid the discomfort or sometimes wearing the holster in the wrong way to minimize the discomfort. So you have to make sure that you buy a holster that is comfortable. Currently, most holsters are either plastic or leather made. The good thing with leather is that it blends with the type of clothes you wear, making the weapon even more concealed. Also, it looks fantastic. However, you will get comfortable with leather after wearing for some time (break period) as it stretches. The good thing with leather is that it is durable thus will save you some few bucks in the long run. You will rarely see people using plastic holster but believe you me that they exist. In fact, it has no break period and holds your weapon better. Plastic holsters are usually formed from thermoplastics. Take for instance the Kydex. The forming of such holsters occurs when the thermoplastics are molded by heat into various shapes depending on the customer. Plastic holsters do not break, and they remain the same with age. You, therefore, have to choose your taste based on your reasons. When you’re preparing for the possibility of an attack, you should note that most attacks will be sudden, up close or physical confrontations. For such reasons, issues of retention must be addressed before you purchase a holster. 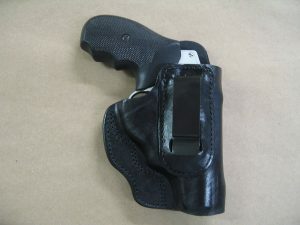 Retention devices range from internal holster devices or thumb breaks. If your holster doesn’t have a proper retention device, your gun might not be retained under physical confrontations like hand to hand defense. Your weapon may easily fall, or the assailant might grab it. Not all holsters that you may see are waist oriented. Some defy logic. There exist shoulder holsters that point back, which defies the simplest rules of firearms. Others seem like they are designed for people with wrist bones willing to partake in a dance to draw. Select a holster that directs your weapon in the right direction. A holster that is poor at gripping your gun isn’t worth wearing, even if you wear in a way that gravity will less likely betray you. It is because the unexpected always happens and you wouldn’t want to have a loose gun at your disposal. It may be real fun carrying that loose holster around, but the fun will stop when you find yourself with weapon flying around simply because you got in an accident or you tripped. Also, ensure that you can get a full grip of your gun while it is still in the holster. In such an event, you wouldn’t have to adjust the grip after drawing your gun. In the hands of someone that respects it, a gun is less dangerous. However, you owe it to other and yourself to minimize the risks associated with carrying the gun. Even though you might have a 99% trigger control, when the adrenaline starts pumping, accidents might happen and you wouldn’t want a criminal grabbing your gun. You should therefore never reveal your concealed gun. Invest therefore in holster having quality safety feature. If you are looking for concealability, then the IWB holsters are your holster of choice. You can either wear it at the 1, 3 and 6 o’clock positions. However, they are less popular due to comfortability issues. You can solve that by wearing trousers two inches bigger at the waist because you will be wearing the holster from the inside of your trouser. Some holsters, however, can be worn outside or over your belt. The IWB is preferred by many because the gun’s grip is rough. OWB, on the other hand, are worn only at the 3 and 6 o’clock positions. The OWB are the most common in the market. OWBs Holsters can easily be drawn while you’re still in the seating position. OWB holsters are slower to access as they are not worn on the strong side, unlike other holsters. But when worn on the strong side, you can tilt it forward for concealment; making the weapon easily accessible. You might opt for them when you are not wearing belts but still wish to have your gun with you. However just like you lose car keys or misplace your phone, the same can also happen to your pocket carry. Choose a pocket carry that hooks to your pocket. This will prevent the holster from dropping with your gun. The build quality of a holster is perhaps the hardest to check, especially if you are not a holster-savvy. Most people might shrug the idea off, but you must certainly give it full attention. This is because the last thing you would wish happen to you is for your holster to come apart and your gun dropping on the floor, which would be embarrassing of course, for there is never an appropriate time for such accidents. Holsters that have been poorly made may become sticky or slippery and can also get in the way of how you draw your gun during emergencies. You should invest in something that is solid because we are talking about your protection here. This is a unique holster made of hard molded plastic. It has a unique passive retention system that ensures that the only point of contact is where the frame meets the trigger. This makes it faster to draw in cases of emergency. It is an Azula Gun Holster custom that is made of leather. It is designed to be worn on the outside by tucking into your waistband. Therefore requires an upper clothing to conceal. It is comfortable to use and easy to draw. The holster is handcrafted. • Has Azula Holsters custom leather inside the waistband. It is a low profile designed by the famous FOBUS holsters. It is designed for maximum concealment. The holster has a passive retention system around the trigger guards that allows for quick drawing and at the same time securely locking your gun. The holster production has been in existence for over 20 years. This is a practical carry solution holster hand-made from Kydex holster and Kydex clip. The design is a customizable Kydex holster that is ideal for any occasion, whether you conceal carry, hunt carry or open carry. For you to get the right holster, you will have to look at various factors before arriving at the best. You won’t just go to the store and select one; you have to do your homework. Among the various Taurus Holsters that exists, our favorite one is the Cal38T6 Taurus 605 It is because of some reasons that make it a favorite. 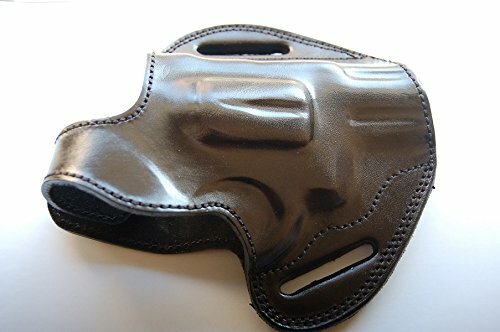 It is that type of holster with an inside surface that is covered by fabric line and has a distinct retention system making it easy to withdraw in emergency situations. Made by the Carl38 leather, the product is a great holster made of durable thick leather that perfectly fits the Taurus 605 gun. The black and red leather colors, together with its relatively small size, ensure that it is concealable in many occasions. You can also wear clothing that matches the holster. Furthermore, it has a good retention system that allows for quick drawing and returning of the gun. The very nature of the material (leather) makes the holster a durable product. Lastly, warranties are often offered for the product, meaning, if the product doesn’t meet your needs before the warranty expires, you can always return. Although, if you follow through the right steps of selecting your holster, you won’t need to use your warranty. In fact, it will last longer than you anticipated for it when buying.